The people of the Langte-Lotey under Nyapin Circle residing in Capital Complex celebrating the Nyokum Yullo festival in befitting manner at Tegdo-Pachin. The cultural event today was inaugurated by the Sagalee PHED Division Executive Engineer Teli Dutto Camdir this evening. 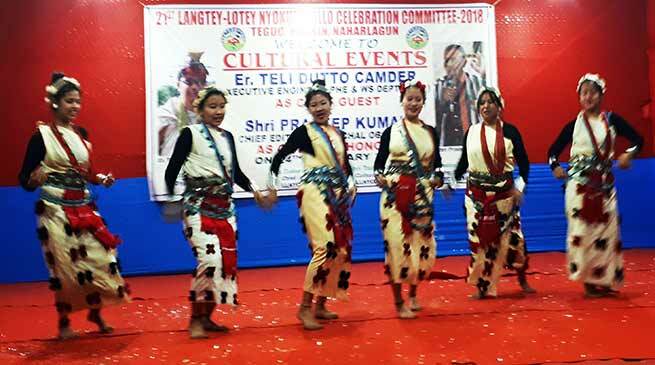 Inaugurating the cultural event Camdir said that celebration of indigenous festival like Nyokum is a great achievement for the Nyishi People and it should be maintained by all tribal community of state which recall and inspire all to maintain the tribal tradition and culture which shows our identity. Our culture is our identity and appeal all to maintain our tribal identity. The festival was first celebrated in the year 1967 and since then it is being celebrated by all which need to carry forward and passed on to our younger generation. Every festival have a message for peace and prosperity of community and appeal all to maintain communal harmony and brotherhood for the development of community and state as a whole. Several traditional cultural competition mesmerised the huge audience while several local artist of the area through their numbers on the occasion thrilled the gathering. LLNYCC-2018 Chief Advisor Tadar Mangku, Culture Secretary Tadar Kachi also address the gathering.